When a relative dies, the emotions and stress involved can make dealing with probate difficult. Knowing what the probate laws are in Kentucky can help you handle this process much easier. In Kentucky, district courts hold probate documents. When someone dies, the person claimed to be in charge of the estate needs to go to the court to file a petition. 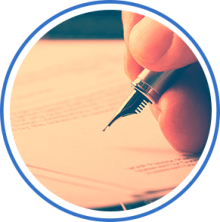 To file the petition, the person must provide the deceased person’s name, death date, an estimate of estate value, an estimate of debt, and a list of heirs. Once the petitioner submits this information into the district court, the probate process begins. While Kentucky reviews the information the petitioner has submitted, the person in charge of the estate must take inventory. It’s important to list all of the property, and all of the assets are accounted for on the list. The petitioner needs to send this list to the court for review within two months of the petition date. It’s wise to make a copy of the list before sending it to the court in case it becomes lost during the process. If the deceased person did not claim anyone in charge of the estate because there was no will or trust, the Kentucky claims the deceased person as “intestate.” Kentucky court contacts all of the family members legally entitled to the deceased individual’s estate. The court divides property and assets among the family members contacted. After someone dies, the rightful family members don’t always receive what they should have received. This may be due to a court’s misjudgment or because of misunderstandings of the petitioner. In these cases, it’s important to find out how you can appeal the decision on the distribution of property and assets. Only a Northern Kentucky attorney can accurately advise you on the legal implications of your case having to do with probate. Due to the complexities of probate laws in Kentucky, it can be difficult to challenge a court’s decision regarding probate. An attorney in Kentucky understands all of the ambiguities in the probate laws, so that he can bring them to light, and represent you in court to help the judge realize that you did not receive what was legally yours in the probate settlement. Without this representation and information a probate attorney provides, the court may not understand why the appeal you have appealed, and may judge against you for additional estate you believe you deserve. The faster you act on probate decisions, the higher likelihood you’ll be able to receive what you believe is lawfully yours. Contact a probate attorney in Florence Kentucky today to start speaking with a legal adviser that can help you with the appeals process. Your loved one may be gone, but treasures remain that can be yours forever, so take action on something that means so much to you.